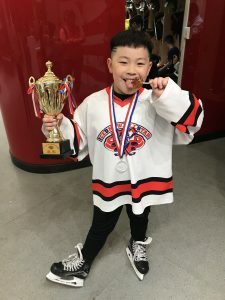 “I love ice hockey!” were the words that came from Y4 student Lucas Lian, not once but four times, during our interview. This is Lucas’s second school year at YCIS and aside from enjoying his classes and friends here, he also enjoys playing ice hockey. Lucas said he started playing when he was seven years old. 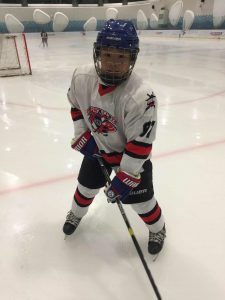 He became interested in ice hockey when he saw other children playing and wanted to give it a try. He says that most of his summer was filled with practice and games which he thoroughly enjoyed. He had practice on Mondays, Tuesdays, Thursdays and Fridays with games on either Wednesday, Saturday and Sunday. Sometimes on the weekend he could even have two games. 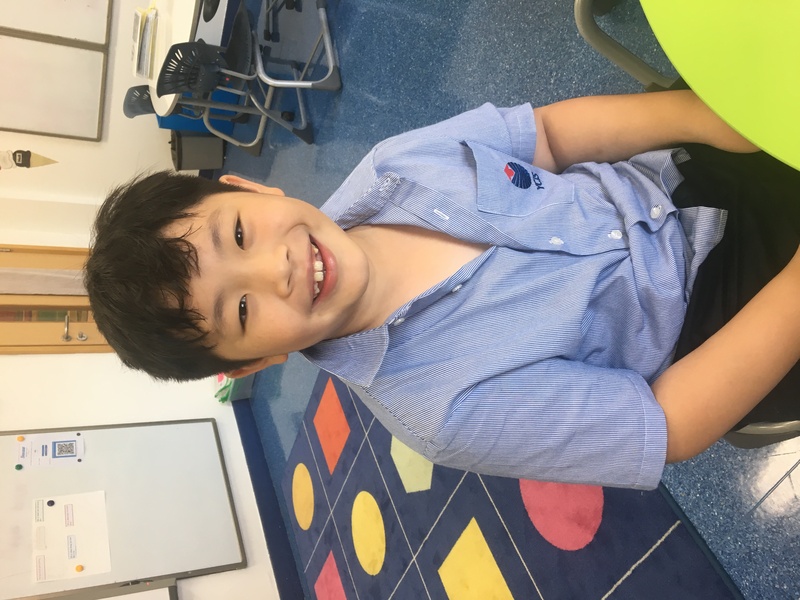 Lucas says, “I play defender but I get to shoot.” He said that he has scored many goals and the feeling after scoring a goal is beyond happy. 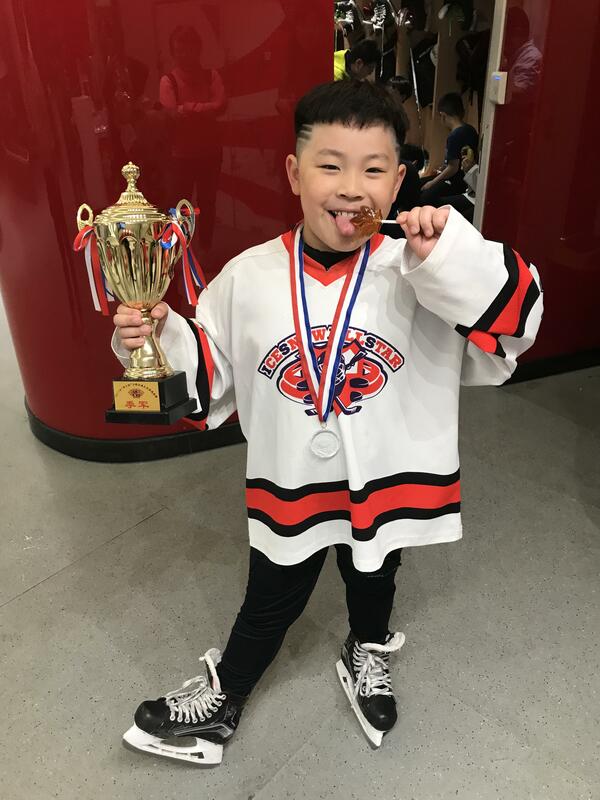 Aside from the physical challenges of ice hockey, Lucas must be a team player and learn how to work with others to be successful. 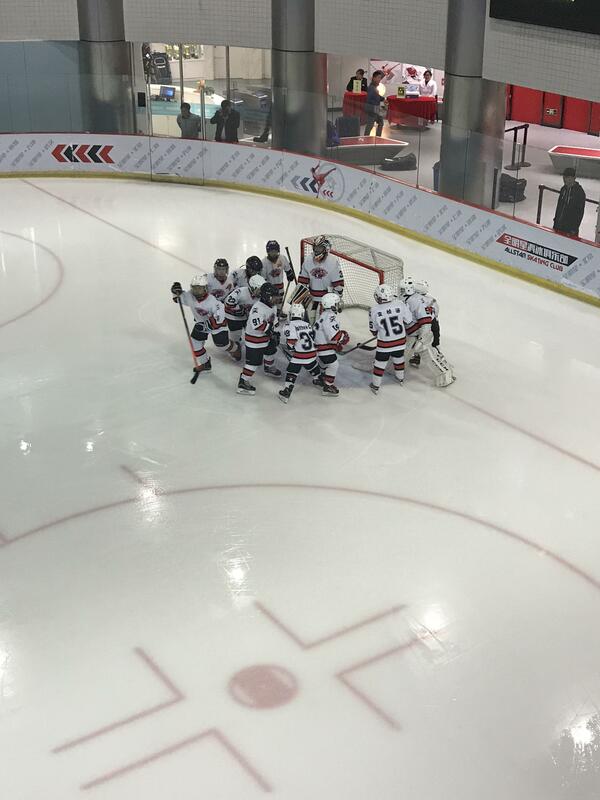 He also states that one of his favourite parts of playing hockey is making new friends. “I’ve made a lot of friends!” exclaimed Lucas. 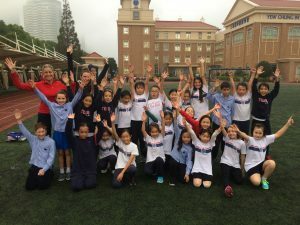 He says that his team is a Chinese team and although there are no students from YCIS Pudong that play on his team or league, he has met students from YCIS Puxi. What is your exact position? What is your role? 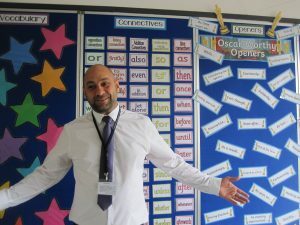 I am the Y6 Teacher/EAL teacher based at Century Park Campus. 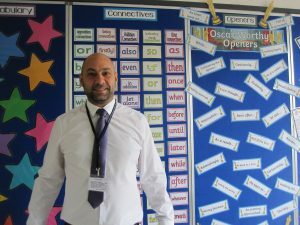 My role is to work closely with the Year 6 Teachers to support them and the children who need their English scaffolding. My primary role is teaching English to Second Language Learners, but also to support these students to access the mainstream curriculum. How do you manage to motivate your students? Especially when you speak to them in a language that they have not yet mastered and may not feel comfortable with? Haha! No secret. Treat them like they’re my own children. I use a great deal of humour too! I’m always looking to design activities that are accessible and use reward a lot! Relationship building is incredibly important. I try to build mutual trust and respect and promote a safe environment where they are free to ask questions and make mistakes. A language rich environment also helps whilst ensuring the students have access to a range of tools to help them. Even an app such as iTranslate goes a long way! Originally, I was a Primary Teacher in the UK where I taught across the curriculum. 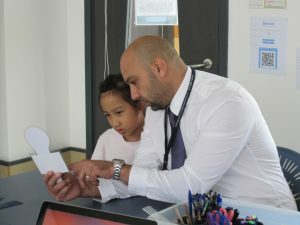 I taught for 2 years in the UK and then 2 years in Abu Dhabi working with Emirati children for the Education Council. Over there, English is taught as a second language, so there is a great deal of expertise within that field. The programme is extremely well-developed and this is how I was able to further develop my skill set of teaching non-native speakers. 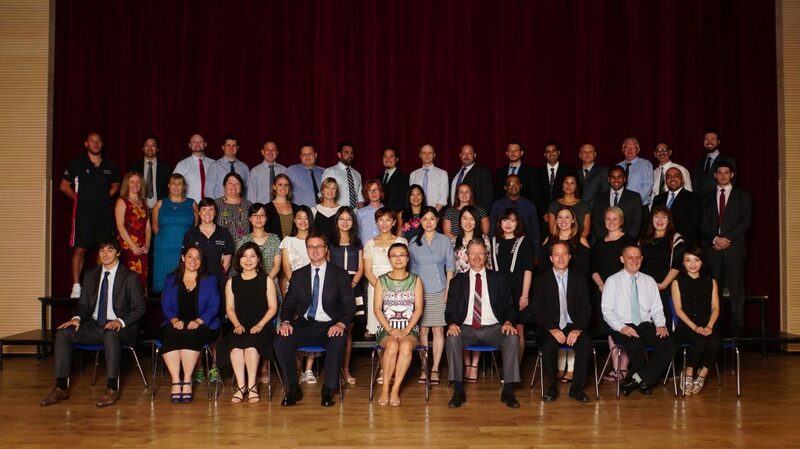 I had the opportunity to take a 2 year on-going professional development programme alongside my teaching. My training was focused around teaching English to second language learners in a way that also developed their communication, collaboration and critical thinking skills. I was able to implement my learning within my role and therefore began to develop professionally in this area. So you just moved from Abu Dhabi to Shanghai? Well, no. Last year, I was back in my hometown in the UK where the school I had worked previously welcomed me back. 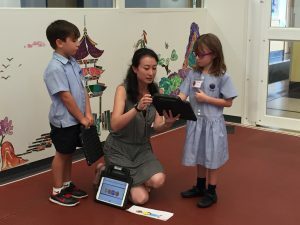 I taught a mixed age group of Year 3 and 4 children and stepped back into my role as ICT Subject Coordinator alongside this. So how long have you taught in total and what did you do before? This is my 6th year teaching. Before that, I used to be a Business Manager. Interesting! We have a similar professional life path. I also have a business educational background. How did you change from the business world to the education world? I have always been interested in helping others and working within the community. So, when I was working my day job, I did some volunteering within the community, and I also got to do some volunteering in a school – at my daughter Lila’s school actually. That is when I realised that I really enjoyed it. I decided then to start my Post Graduate Certificate in Education (PGCE) and trained in East London in a real multicultural environment and that is how I became a certified teacher! Since then, my passion for helping others hasn’t changed. Before, I used to help people to make money, now I help people to grow! How long did you work in the business world and if you don’t mind me asking you – why had you chosen this field in the first place? Well, when you are young, you tend to choose the field that gives you a quick gain. When I was at school, I became involved with a friend of mine in producing and selling T-shirts to make a living. So, in order to understand the mechanics of being self-employed I chose Business Management as a degree subject. Upon leaving University I needed to pay back some of the fees, so the T-Shirts got pushed to one side and I ended up in a sales role. I then worked for 12 years in different business industries: retail, hospitality, etc and developed a career in Business Management. But, you know – the business world is very demanding and it can become challenging when your priority in life is to spend time with your family. The career change was not easy, especially financially but I had the full support of my wife and children, which made this transition smoother. Wow! Yes indeed, that’s a bit of a challenge. 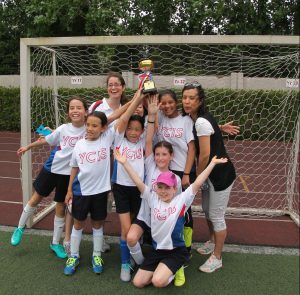 So, what brought you to Shanghai and to YCIS more specifically? It was always a dream for me to take my family abroad. After spending two years in Abu Dhabi, we felt that it was the path for our family. 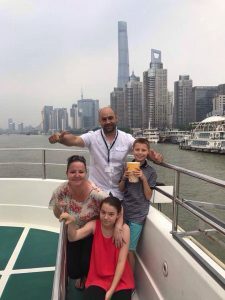 My wife and children loved the experience of living abroad. They were the ones asking for it again when we went back to the UK last year. 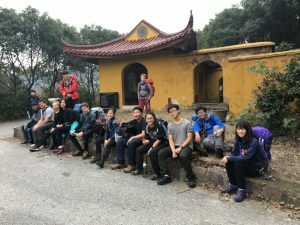 We enjoyed being in a new country, a new environment, living in an international setting, and the cultural diversity is a priceless experience. Shanghai? It was luck! We were interested in discovering Asia and when I started to apply, I received offers from different schools and YCIS got me intrigued enough to apply. It looked very well organised and the philosophy genuine. My gut instinct was quickly confirmed with all the recruitment processes – professionalism and immediate warmth with Damien and Rob during the interview. Role, location, people, everything just seemed to fit. 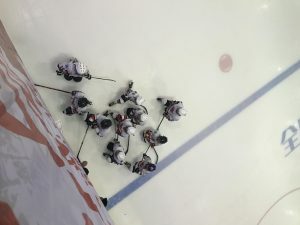 Communication was efficient, fast emails and we received support all the way until we arrived in Shanghai. 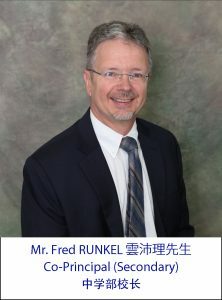 How was the settling in Shanghai? How is your family adapting in this new environment? The settling in Shanghai was great – We felt no pressure because of the processes in place. Moreover, YCIS colleagues are amazing people. No matter if it is YCIS staff or YCIS teachers, everyone is very supportive and responsive to your requests. There is definitely an ethos of collaboration and communication. The professional development opportunities are evident and there is certainly a strong support network. The adaptation of the family? Yes, everyone is adapting well and there are no days where we have had any regret. We have already got our first picture at the Pearl Tower! But of course, the one taking the picture is always missing on it! My last questions before you go back to class. The same question we asked on the Orientation Day, what are your wishes for this new school year? I wish to do an incredible job for the children by helping them progress quickly in their learning. I wish they will walk away with a strong sense of achievement having had a memorable year. Thank you for your time Zaid. It has been a great learning experience talking to you! Parents of younger children need to know the full picture of their child’s educational journey, so we take you into the Secondary School. 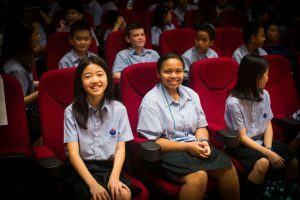 We take a glimpse at some of the exciting things that are taking place for our Year 6s and Secondary students at Century Park Campus. 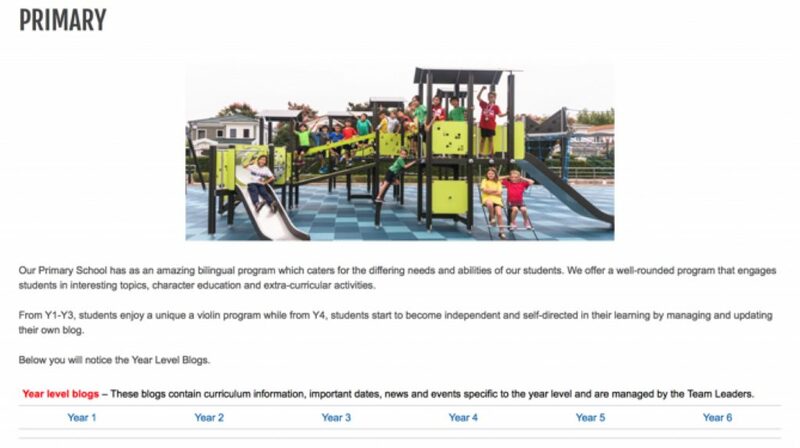 Remember, you can always access Secondary information from our ECE & Primary News Blog Home Page. For the sake of convenience for our parents, all school blogs now use the same password: RPCP. You can now use this password to access the Secondary School blogs as well. For more information, feel free to contact rpcp.parentrelations@sh.ycef.com. We will be happy to guide you to the corresponding departments and people in charge. 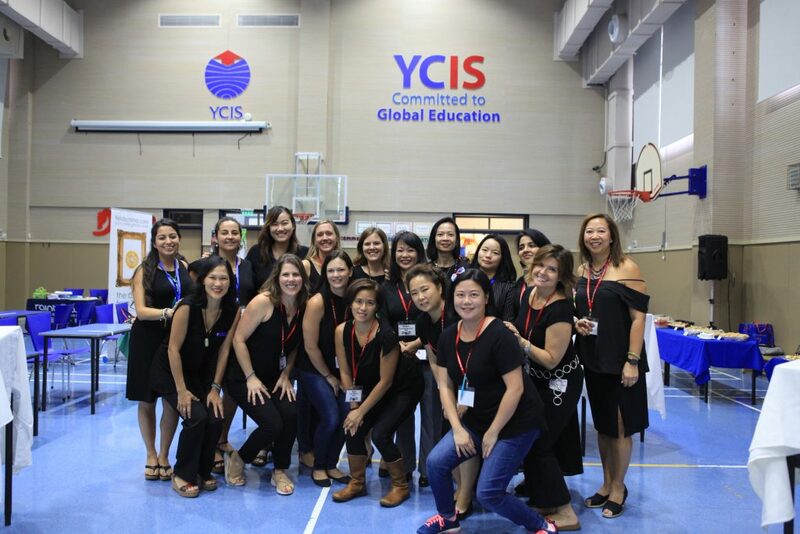 Parent Relations at YCIS plays a key role in our school, because we believe that a strong and close partnership between parents and the school will benefit the children. 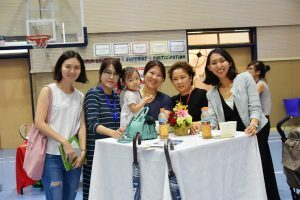 Our aim therefore, is to facilitate as many opportunities for positive and meaningful interactions between the school and the parents during the course of the school year. With parents and the school working closely in partnership. 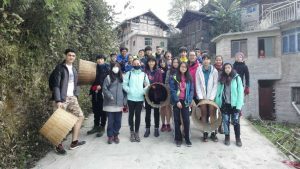 We are able to together, build a unique school community that cares about the environment in which our students will learn and grow. 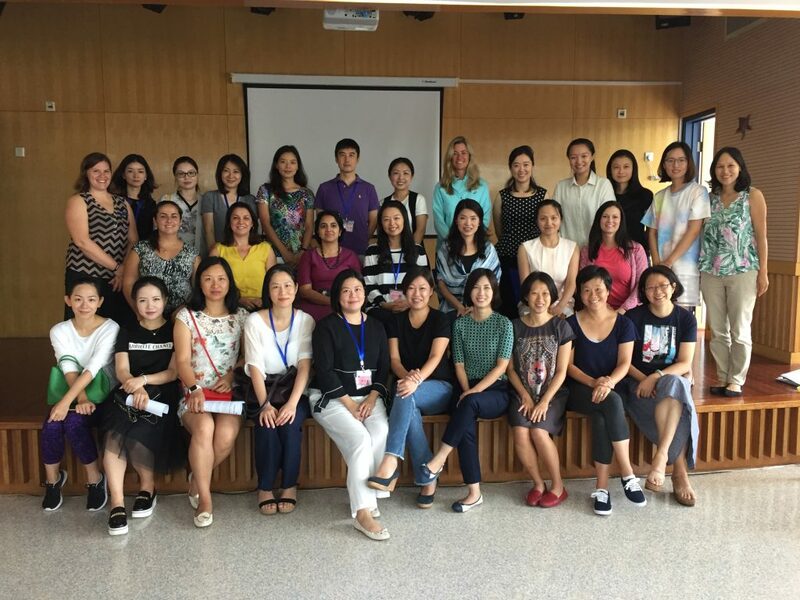 Once your child joins our school, you as parents and caregivers automatically become members of POP (Parents Organisation Pudong). Due to all the reasons explained above, YCIS has dedicated two staff members to work with Parents. 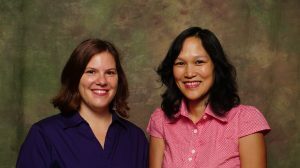 They are Roseline Yang, Community Relations Officer and Nadine Runkel, POP Liaison Officer. Both of these hard working and commited ladies, ensure that parents are well informed, involved and valued. If you have not had a chat with Roseline and Nadine, drop in and say ‘Hi’. From Early Childhood to Primary, two parent class representatives support the class teachers to relay information to parents whenever help is needed for fieldtrips, class parties, or even giving added-value to the programme. 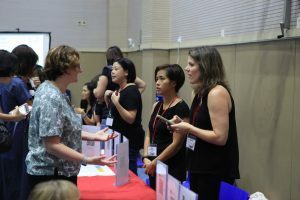 Sharing parent expertise in specific fields has contributed to topics explored by the students within their class and year level. Some parents are also excited to share about their countries and cultural celebrations. Parents offering their time to help in preparing art decorations for class activities, art exhibition and drama plays have also definitely allowed teachers to focus on better quality teaching and outcomes. 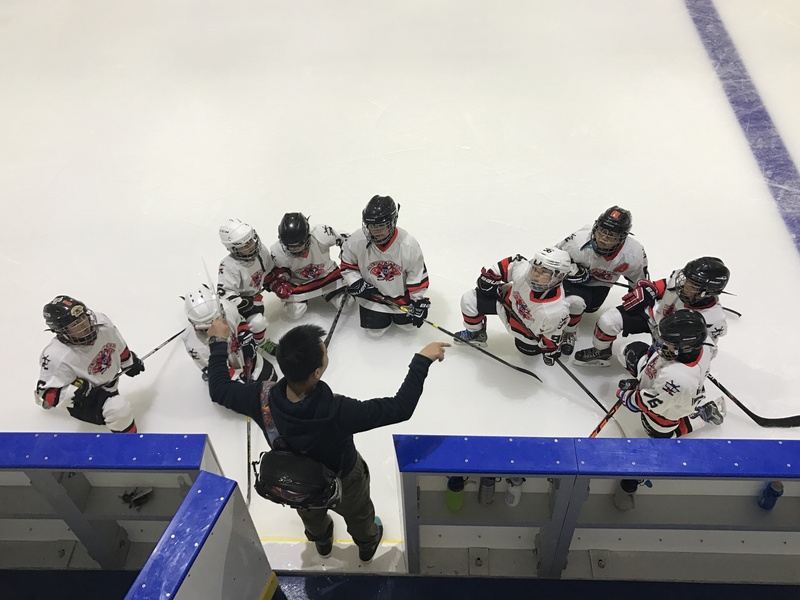 Our Co-Curricular Activities have been growing over the past few years and parents have played an important role by helping to coach our sport teams. There are now so many weekend teams playing that having parent coaches for these teams has become very important. Our students are the beneficiaries, and have been able to enjoy themselves, whilst developing their skills! I know the parents have certainly enjoyed the coaching experience, and many sign on again the next year. Getting involved as Girl Scouts Leaders has also contributed to the personal development of our female students. We would also like to introduce our POP Core Committee for this school year. The following committed volunteers were voted onto the Core Committee in June and are excited to plan and carry out our favourite community events, like the POP Picnic and Bazaar, Spring Charity Brunch and Global Child Day – to name a few. 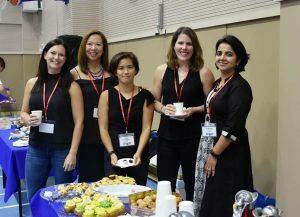 If you would like to support the Core Committee by helping with a specific event or volunteer your time to help with the used uniforms or other projects, feel free to approach any of the POP Core Committee members, or Roseline and Nadine. We look forward to a great year together! You can usually find us in one of the Parent Rooms (ECE Basement, near the RP Courtyard or at Century Park Campus in the school office (Rm B116) or in the Scoop Office (adjacent to the RP Parent Room). We are here to help you, work with you and most importantly, to build a strong school community WITH you, our parents. Together with POP and its Core Committee, we facilitate events, workshops and tours for parents – from parents. We are always looking for good “Scoops” – any great news or photos you would like to share with the community, and our door is always open. If you have concerns, comments or suggestions – come and see us and we would be happy to help you or point you in the right direction! We look forward to an inspiring and unforgettable school year 2017-18! 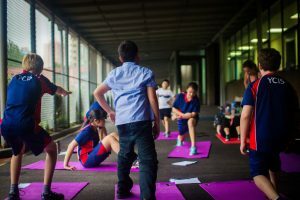 YCIS is committed to providing a holistic programme for all students, and the Co-Curricular Programme is one of the key ways in which this goal is realised. 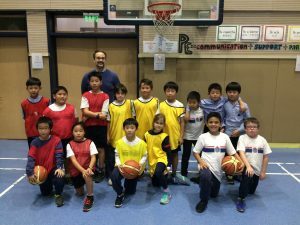 We are very excited to introduce to you our new Co-Curricular Activities (CCAs) programme for YCIS Shanghai – Pudong Campus for 2017-18. 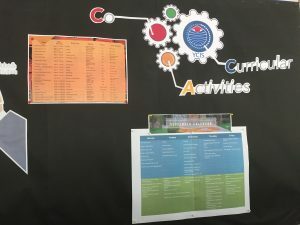 This year we have renamed our former ASAs (Primary) and ECAs (Secondary) to ensure we have a consistent name across the school, and because we believe that these activities are not just after school, but at lunch times and on weekends as well. 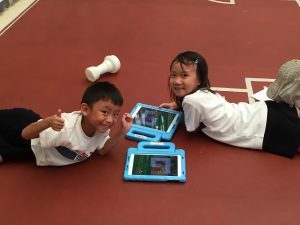 Co-Curricular Acitivities are all the activities and opportunities we provide the children which fall outside the daily lessons at school, but play an essential role in adding to the overall educational experiences for our students. 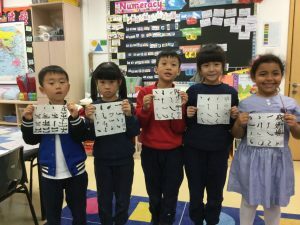 CCAs provide students opportunities to try new things such as a musical instrument, a new language, learning a new skill in Chinese such as calligraphy, or playing a new sport. The CCAs develop skills in the students whilst also allowing them to develop interests. This year there are over 70 activities that our Primary students will be participating in – this is an amazing result. 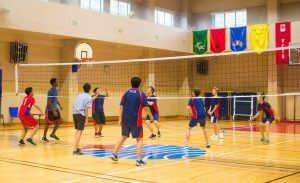 The variety of activities on offer has never been more diverse or interesting for our students. 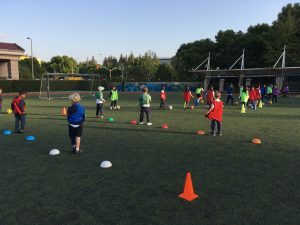 There should be something there for every child to try out, and many students will want to sign up for more than one activity. 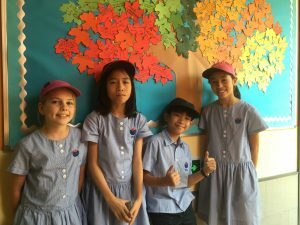 Our CCAs have been a major focus for our school over the past few years. We have listened to suggestions and feedback from parents and students, and the school has continued to add to what we offer. The buses provided at Regency Park Campus during the CCA season, and the CCA buses at Century Park Campus which run all year have allowed more students to participate. Girl scouts once a month on Wednesday afternoons. 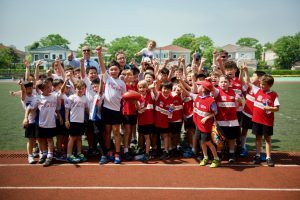 On Saturdays, students are able to sign up for football, tennis, basketball, chess club and more activities will continue to be added. In Music, there are many CCAs on offer again this year. 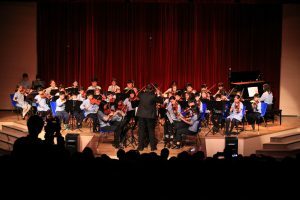 Students from Year 3 up are able to join the Primary Orchestra and in the second semester, there will be an advanced violin CCA to develop Year 2 and 3 students who will later join the Orchestra. 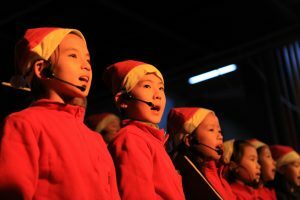 The Golden Voices is our choir CCA for students in Years 3-5 and they rehearse after school on Mondays. We are pleased to introduce Ukelele as a new CCA this year, and students can sign up for this CCA both at Regency Park Campus and Century Park Campus. Finally, there are all our sports teams, representing the school in weekend tournaments. We have 110 students playing in our weekend YCIS football teams from Years 2-6. We also have 57 students who are in our YCIS Swim Team. 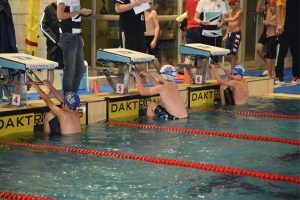 These students practice during the week and we will enter some weekend swimming meets during the course of the year. 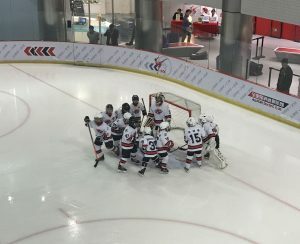 Other representative sports teams include Australian Football (AFL) and Basketball. Now that these programmes have been in place for a few years, it is extremely clear to all that our teams have become much stronger and the development of the students has been obvious. So with so many activities taking place after school, during school and on weekends, there is no reason for your child to not sign up and join in. We look forward to a great year of CCAs. We have been back to school for 4 weeks now! For this first edition of the newsletter, the editing team suggested we use video as a media to share our students’ thoughts. 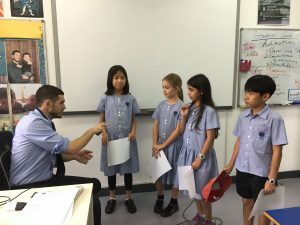 Last year, we had Year 5 and Year 6 students writing about their thoughts on a specific topic. 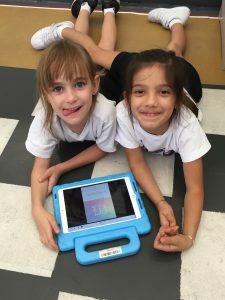 For this first edition of the newsletter, we will use video to give the opportunity to the lower primary students to express their feelings and thoughts. Let’s watch what they have to say about being back to school and their goals for this new school year! Click on the video below to watch what Carla Fonts, Anne Cui and Teresa Pan have to share about being back to school! 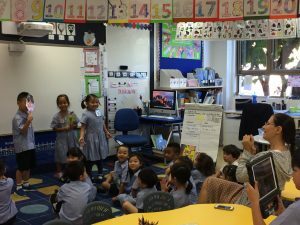 – Many thanks to Elisabeth Liau, Year 2 Leader for compiling the video. 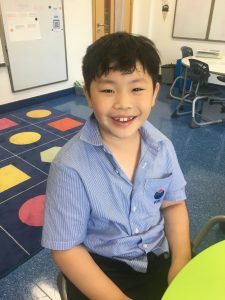 Click on the video below to watch to what Julia Shih, Emmanuel Teh, Louise Coquerel and Tiffany Gu share their personal goals for this new school year and what they are looking forward to. Many thanks to Cathal Grimes, Year 6 Leader who helped me put this together! Click on the video below to find out what goals some teachers are working towards this year. 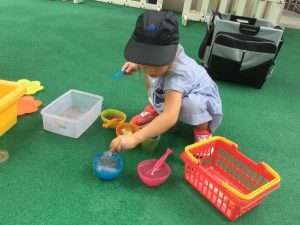 In ECE, children learn through a play based emergent model. Children are encouraged every day to express themselves and to think about problems. The curriculum, although play based, is thoughtful and directed at the overall learning outcomes we want our youngest students to master. 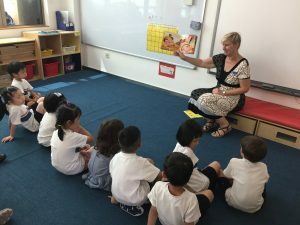 Last week in a K4 class, the teacher read ‘Jack and the Bean Stalk’ to the children. 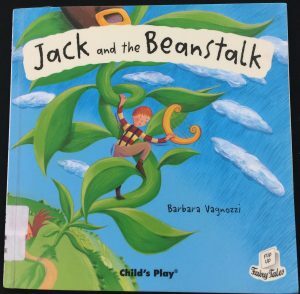 The story involves Jack who climbs a bean stalk and takes items from the rich giant to help his family who were very poor to buy food and other necessities. The teacher asked the children whether they thought Jack was right or wrong in taking the items? Some children were very strong in their belief that Jack was correct as it meant that his family would no longer be poor. Other children were equally as strong in their view that Jack was wrong in taking items that do not belong to him. 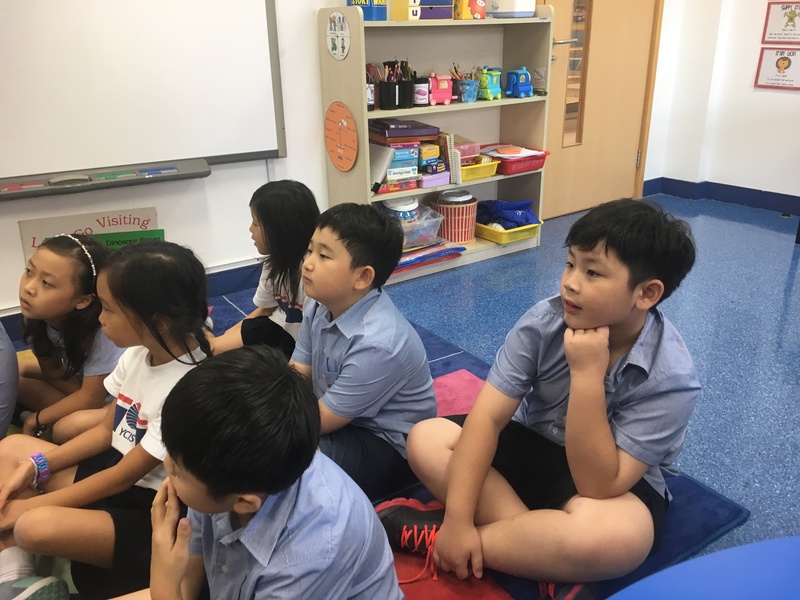 All children were able to listen to each other and hear why others had a different theory on what is right and what is wrong. The idea is not to give the children an answer but to encourage them to think for themselves and form a theory that may change over time. Whilst teachers are responsible for curriculum planning and implementation, children are considered to play an active role in this process. 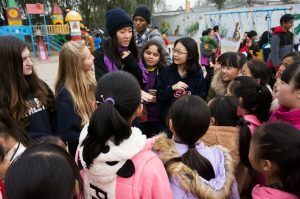 This role is realised by the teachers’ continuous attention to the children’s interest, their wonders and curiosities. Every room is set up to encourage choice with open-ended activities, that encourage thought and choice in many things that children do. 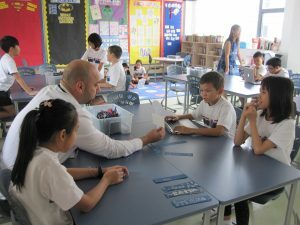 The teachers lead and support all individual learning and build upon simple activities that lead to more complex work. Children from every year level should not be passive receivers of information; rather they should be encouraged to think and explore options in their learning environment that not only are inviting but also encourage a child to express themselves. 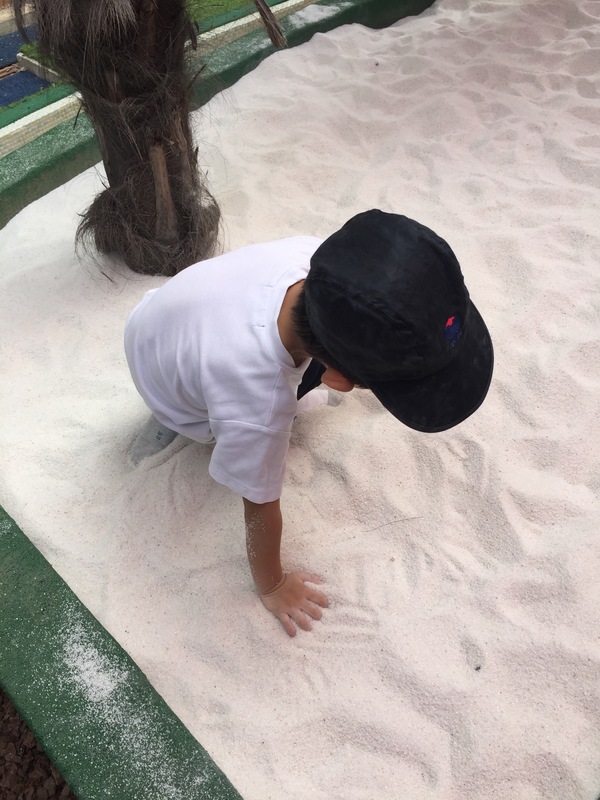 This could be through multiple ways, such as through art, sensory play or creating a theory on a topic. Young children ‘feel’ learning, when we involve as many senses as possible. In play, young children will retain more of the information that we want to impart on them. Children may finger paint their name or shapes, or line up colored cars to count. 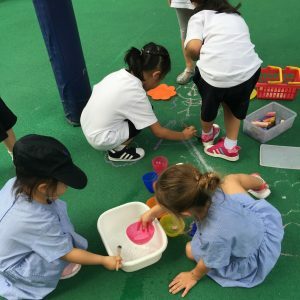 This is also why the ECE curriculum is full of messy, exploratory, wet and colourful play. 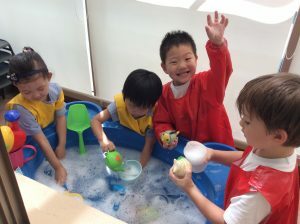 The ECE Curriculum is set up so that children build upon their expressive learning capabilities. When children become confident in their ability we always see growth in learning areas such as literacy, mathematics, languages and all other learning outcomes. We believe that in order for children to fully benefit from their education, there needs to be a close partnership between the parents and the school. 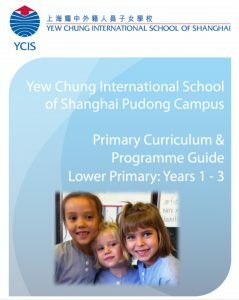 YCIS has a well established and well researched curriculum which is challenging, rigorous and meets the needs of all students. We make the curriculum and the teaching and learning taking place in the school readily accessible to parents so that they can understand what we are teaching their children. Rather than the response to “What are you learning at school?” being “Nothing”, parents are able to follow what their child is learning and have meaningful conversations with them at home. 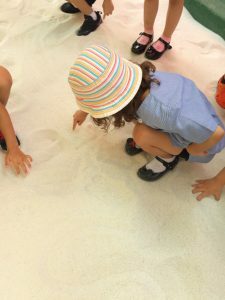 In this article we provide further information about our YCIS curriculum and how you can access it, to support your child at home. Yearly Overviews provide you with a sequence of the topics that will be covered across all subjects for each year level. 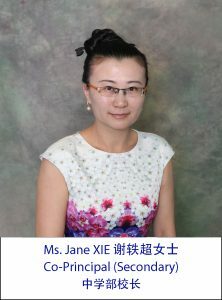 This is a great way to see how teachers provide authentic opportunities to integrate core subjects with specialist subjects as well as Chinese Studies. The Topics of Inquiry document provides an outline of the various Science, History and Geography units for each year level. 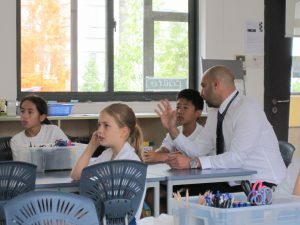 These have been designed to allow students to develop an understanding of the world, about themselves and others, where they are from and where they live. Parents may choose to use this document to front-load their child before the unit comes up – e.g. reading some books about the topic, or doing some research on the Internet. The teachers can provide more information about what they will be covering if parents are interested. 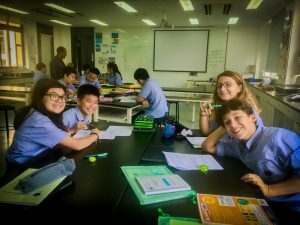 Our YCIS Curriculum has been developed to provide explicit teaching of skills and concepts that will allow students to transfer and apply their knowledge in various contexts, as well as be transferable when they move on to other locations in the future . We want our students to be able to think critically, understand different perspectives and be active participates and contributors amongst their peers and in the community. Our students achieve highly, due to our unique curriculum delivered by enthusiastic, highly trained teachers.